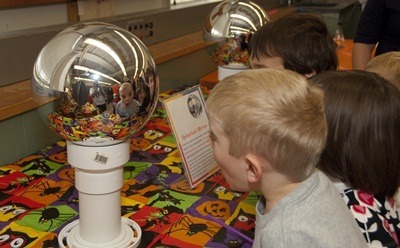 Two years ago, NIU’s popular Haunted Physics Laboratory was supersized into Spooky Science Saturday. Now the event, which uses Halloween themes to teach young people about the wonders of science, is about to get exponentially bigger. NIU is gearing up to hold its first Science, Technology, Engineering and Math (STEM) festival from 10 a.m. to 5 p.m. Saturday, Oct. 23, at the NIU Convocation Center. 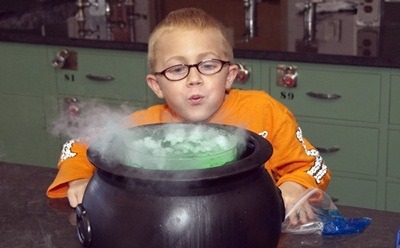 Open to the public, STEMfest 2010 will feature spooky science demonstrations from years past — and much more. Event organizers expect the hands-on activities for children and mind-blowing exhibits to attract more than 5,000 people. “This has been such a popular event that we’re expanding considerably, which is why we’ve moved to the spacious NIU Convocation Center,” says Pati Sievert, NIU’s coordinator for STEM Outreach. STEMfest promises to both entertain and educate. Volunteer NIU students and professors will be on hand to explain the science behind the demonstrations. Visitors can explore a darkened laboratory made spooky by a fog machine, glowing liquids, colored shadows, lightning bolts in a plasma globe, extensive hands-on laser displays and a glowing gaze from Albert Einstein. Other STEMfest areas will feature funhouse mirrors, levitating globes, innovative STEM research displays and mini-presentations by NIU scientists and STEM innovators from across northern Illinois. STEMfest attendees also can learn about storm chasers; investigate the ultra-high-mileage vehicle (1,265 mpg!) 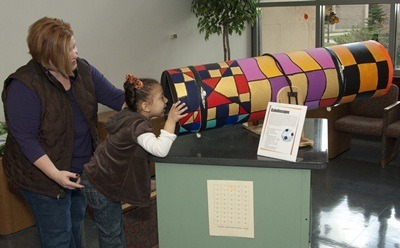 and other award-winning vehicles designed by NIU students; observe sunspots and see how a telescope works; detect cosmic rays with cosmic-ray detectors and cloud chambers; create music, animations and videos in a technology playground setting; and participate in a spaghetti tower building competition. The STEM Book-Nook will allow parents and children to preview science and engineering titles for all ages. And visitors need not go home empty-handed. They can pose for pictures that are digitally enhanced to include famous scientists or make and take home slide whistles and “talkie tapes”—thin strips of plastic with ridges that “talk” when you rub your fingernail over them. STEMfest is part of the larger NIU STEM Outreach effort to spark young people’s interest in science, technology, engineering and math well before they reach college age. The event is being held in coordination with the Oct. 23 U.S. Science and Engineering Festival, which will take place on the Mall in Washington, D.C., and at locations nationwide. The NIU festival is modeled after the San Diego Science Festival and successful science festivals in Europe. Members of the public can arrive any time during the open-house event. While entrance is free, a donation is suggested, and “mood pencils” will be handed out to the first thousand donors. Parking will be available at the Convocation Center for a $5 fee. For early STEMfest attendees who would also like to take in the 3 p.m. Huskies vs. Central Michigan football game, NIU Intercollegiate Athletics will provide vouchers for reduced ticket prices. Sievert also is looking for volunteer workers, particularly college students and teachers. Area teachers who participate will earn Continuing Professional Development Units. They also will receive a booklet on how to create similar displays for their classrooms. To volunteer or for more information, visit the STEMfest website. The event is sponsored by Abbott Laboratories, TCF Bank, LaserFest.org, the DeKalb County Community Foundation, the Midwest Girls Collaborative Project and NIU Engineering and Technology Alumni Society.